So I had a little time off this week and decided to do something very important. In an ongoing investigation, I completed my martyred assignment of consuming more hot dogs than humanly necessary to unveil just where one can find the best hot dogs in NYC. The search extended from midtown Manhattan all the way dwn to Coney Island, and with a few stops in between. I feel a bit like an affectionate orphanage director when it comes to each of these dogs; I’m not sure I can pick an absolute favorite because they are all so great in their own way. At Papaya King I kept things basic: two frankfurters with kraut, onions, ketchup and mustard and washed it down with papaya juice. Perfectly blistered casing makes these dogs delicious to bite into. There is something about the juice that soothes the belly just right, which, somehow, helps you not taste the dog all day. At three dollars this is by far the best deal in Manhattan. Due to the clout from the masturbatory media, I was drawn to Criff Dog on the LES (apparently copied a place in NJ Rut’s Hut). 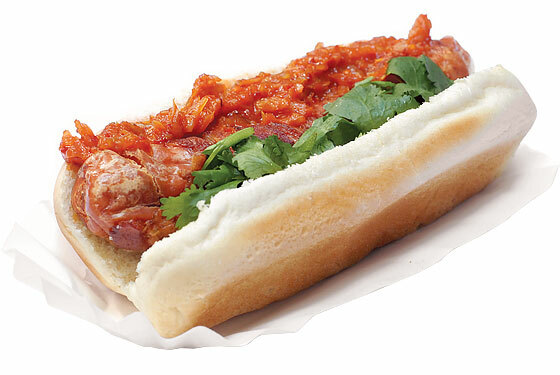 This place features a pork-based deep fried dog, unlike most NY dogs which are all beef and usually grilled. To be honest I mainly went here to eat the creations of two famous chefs Wylie Dufresne and David Chang. 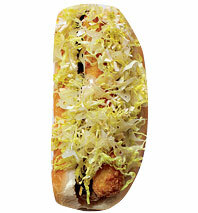 The Chang Dog is deep fried and bacon-wrapped served with a red kimchee puree, and the Dufresne which was fried sans bacon and topped with fried mayonnaise, freeze dried onions, and lettuce. Both tie for most interesting dogs, but I don’t think I have converted from chili just yet. 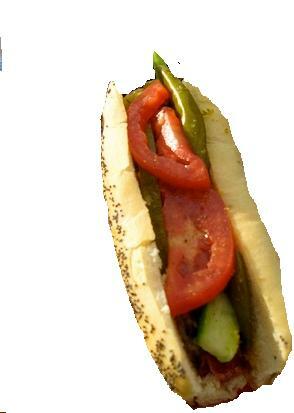 Enter the newcomer: The Fulton Landing hot dog stand/lot across from the famous Grimaldi’s Pizza. I say skip the effin line for the pizza and get a dog at this new winner. I started off with a curry dog (chicken braut topped with a red curry sauce and curry powder served with a small pita) which was succulent but not quite enough. I spotted a Texas Meal Dog on the menu, and a really ridiculous side of me feels obligated to order such things as though they were made specially for my Lone Star State-born self. Honestly this was far better than any chili dog I have had in Texas. Made with a hearty braised beef chili and pickled red onions this did not even remotely resemble the stuff from the can. 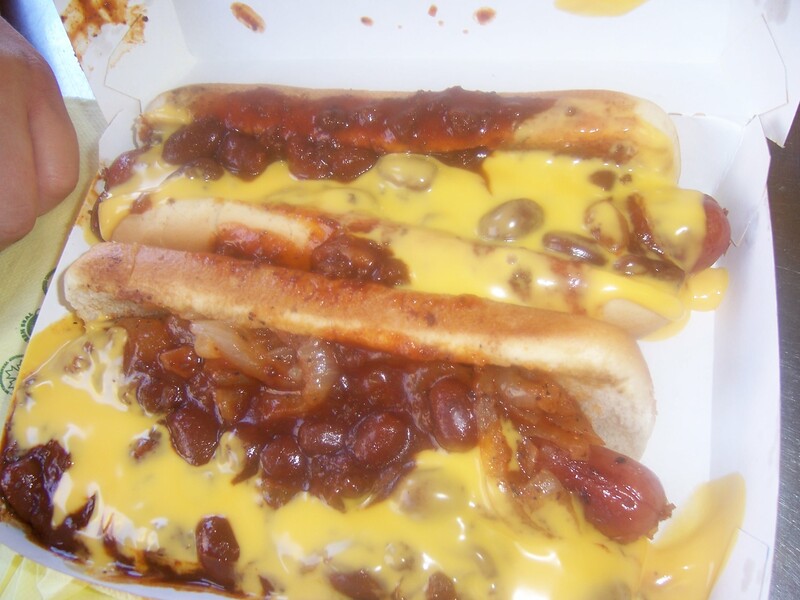 Speaking of stuff from a can, I am quite certain that at the mecca of hot dogs, Nathan’s Coney Island, the chili there which was overblown with beans was the latter. While this certainly didn’t ruin my experience it is simply a reminder that some things are considered great mainly for the sake of nostalgia. The challenge of holding down the dog on the Cyclone might be the best part of all. This entry was posted on September 15, 2008 at 9:06 pm and is filed under Uncategorized. You can follow any responses to this entry through the RSS 2.0 feed. You can leave a response, or trackback from your own site.